The origins of spherical trigonometry in Greek mathematics and the major developments in Islamic mathematics are discussed fully in History of trigonometry and Mathematics in medieval Islam. The subject came to fruition in Early Modern times with important developments by John Napier, Delambre and others, and attained an essentially complete form by the end of the nineteenth century with the publication of Todhunter's textbook Spherical trigonometry for the use of colleges and Schools. This book is now readily available on the web. The only significant developments since then have been the application of vector methods for the derivation of the theorems and the use of computers to carry through lengthy calculations. 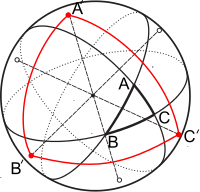 A spherical polygon on the surface of the sphere is defined by a number of great circle arcs that are the intersection of the surface with planes through the centre of the sphere. Such polygons may have any number of sides. Two planes define a lune, also called a "digon" or bi-angle, the two-sided analogue of the triangle: a familiar example is the curved surface of a segment of an orange. 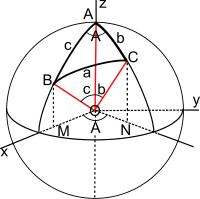 Three planes define a spherical triangle, the principal subject of this article. 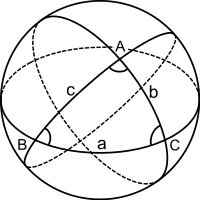 Four planes define a spherical quadrilateral: such a figure, and higher sided polygons, can always be treated as a number of spherical triangles. These identities reduce to the sine rule of plane trigonometry in the limit of small sides. Since the right hand side is invariant under a cyclic permutation of the spherical sine rule follows immediately. Banerjee  provides proofs using elementary linear algebra with the use of projection matrices. The result follows on dividing by . Similar techniques with the other two cosine rules give CT3 and CT5. The other three equations follow by applying rules 1, 3 and 5 to the polar triangle. 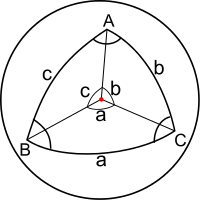 Since the area of a triangle cannot be negative the spherical excess is always positive. Note that it is not necessarily small since the sum of the angles may attain 3π. For example, an octant of a sphere is a spherical triangle with three right angles, so that the excess is π/2. In practical applications it is often small: for example the triangles of geodetic survey typically have a spherical excess much less than 1' of arc. (Rapp Clarke, Legendre's theorem on spherical triangles). On the Earth the excess of an equilateral triangle with sides 21.3 km (and area 393 km2) is approximately 1 arc second. where denote latitude and longitude. This result is obtained from one of Napier's analogies. In the limit where are all small, this reduces to the familiar trapezoidal area, . 1 2 3 4 5 6 7 8 9 10 11 12 13 14 15 Todhunter, I. (1886). Spherical Trigonometry (5th ed.). MacMillan. This fifth edition is the cleanest available free version on the web The Gutenberg sources also include a latex version of the text. The latest (posthumous) and most complete version was published in 1911, co-authored with J. G. Leathem. The third edition has been issued by Amazon in paperback and Kindle versions . The text has been typeset but the formulae and diagrams have been pasted in as somewhat unsatisfactory images. ↑ Delambre, J. B. J. (1807). Connaissance des Tems 1809. p. 445. ↑ Another proof of Girard's theorem may be found at .